Well, if I had a restaurant this is how the starter would appear on my menu. Don’t get me wrong, I am not hankering to be a restaurant owner at all. After 8 years of the industry as a profession, I do not long for the hours. I have done my fair share of 18 hour shifts. I have opened at 8am and closed at 6am. I have dealt with rude and ignorant customers, staff complications and even owners who are clueless about the industry. I have worked in the kitchen, the bar, as a waitress, a cashier, and as a manager. I spent time in a relationship with a restaurant owner and it can be hell. Customers who don’t leave, or customers who don’t tip! Customers who treat the waitresses like shyte and others who think it is their right to complain. But, if I won the BIG lotto I would open a delicatessen. It would be based on the ones I have seen in Europe and it would offer all sorts of delights. Home made mayonnaise, fresh herbs, fine cured products, delicacies and home baked and home cooked meals. I would have to have a sausage counter, and a cheese counter and a bakery …. See, this is why I need to win the lotto. This is the type of take home dish I would include, beautifully poached crayfish, freshly made mayonnaise and the soft, delicate taste of coppa. I would offer all sorts of citrus fruits lightly candied, and the fresh fruits sitting alongside them. you can use any oil you like for the mayonnaise, I just prefer to use Canola for the taste. Grapeseed or olive oil or a combination is also good. You may have seen the recipe for the stick blender elsewhere on the blogs. I developed this recipe over 20 years ago and had never seen it before. This was published in Lavender and Lime in 2010. 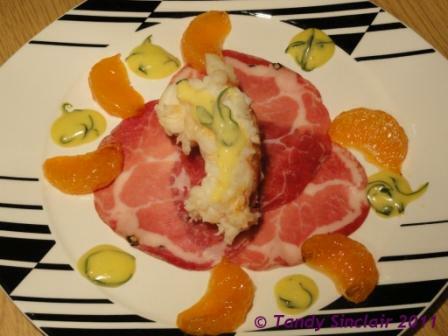 I have chosen ClemenGolds for this recipe so that I could enter it into the Woolworths competition. Wow, this looks too good to eat, Tandy. What a great starter. I would definitely frequent your restaurant. Wow! Awesome dish, Tandy. Thanks for sneaking in some ClemenGold! Wow, this looks amazing! Would definitely order it if I saw it on a menu!